Oleum Cinnamomi Cassia-. - Cassiaol, Chinesisches Zimtol, Zimtblu'tenol. Origin and Production. Although the plant, the Cinnamomum Cassia, Blume, from which the cassia oil is obtained has been known for a long time, considerable uncertainty existed until recently as to the part of the plant from which the oil is distilled. Thus it was supposed that the oil was distilled from the unripe fruits which are sold as Flores cassia?, hence it was called Zimtblutenol. 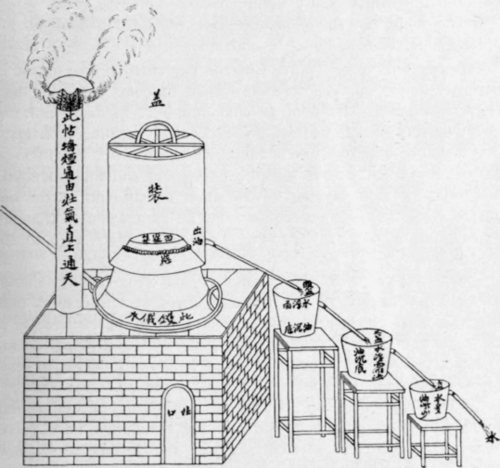 It was not until 1881l) that it became known that the leaves of the cassia shrub were used in the distillation of the oil at In-lin, north of Pak-hoi. However, this oil was reported to be more viscid, darker and less fragrant than the cassia oil. In the description of his trip into the cassia district, undertaken by H. Schroeter2) in 1886, he also mentions the production of oil from leaves. It was supposed, however, at that time that the leaves produced but little oil, and that of an inferior quality. In order to ascertain the properties of the leaf oil, Schimmel & Co., secured, through the aid of Melchers & Co. of Canton, not only leaves, but all parts of the cassia shrub that are utilized in the production of the oil3). Upon distillation, bark, flowers, flower stems, branches and leaves yielded oils that were much alike in properties and aldehyde content. Inasmuch, however, as bark, flowers and parts of flowers are out of the question because of their high price, leaves and branches only can come into consideration as far as the production of the commercial cassia oil is concerned. As a matter of fact, aside from waste bark, only leaves are probably used for distillation purposes, as was ascertained by O. Struckmeyer, who, in 1895, undertook a trip4) into the cassia district for the firm of Siemssen & Co., of Hongkong. The distillation is conducted in the valleys of the provinces Kwang-si and Kwang-tung, in places where abundant water for condensation is available. 1) Deutsches Handels-Archiv for Sept. 2nd, 1881, 262. 2) H. Schroeter, Bericht iiber eine Reise nach Kwang-si. 1m Herbst 18S6 unternommen. Hongkong 1887. 3) Report of Schimmel & Co. October 1892, 13. 4) Ibidem October 1896, 19. The distilling apparatus used in that locality1) (fig. 38) consists of a brick furnace with an iron pan mounted in masonry. On this rests a wooden cylinder coated on the inside with sheet iron and open at the top. After the cylinder has been charged with cassia twigs and leaves and filled half with water, it is closed with a peculiarly shaped helmet of sheet iron. The apparatus is sealed by means of wet clothes pressed between the joints. On the inside of the lower margin, the helmet is provided with a gutter in which collects the condensed distillate that has gathered on the cooled walls. By means of a tube it is conveyed from this gutter to the receiver. The condensation is effected from without. The distillate from the gutter flows into a series of receivers arranged as a cascade, the oil collecting at the bottom. The water from the last receiver is used for the next distillation. Fig. 38. Chinese still for cassia oil. 1) Report of Schimmel & Co. April 1S93, 11 and October 1896, 13. Cassia oil is shipped in lead canisters each containing 16 2/3 lb. net, four of which are put into a case. The spaces between the canisters are tightly packed with rice chaff. The labels on the canisters have remained unchanged for a long time, both as to style and color. In 1 to 2 vol. of 80 p.c. alcohol cassia oil is readily soluble. Its behavior toward 70 p.c. alcohol differs in this respect that whereas most oils are soluble in 2 to 3 vol. of this solvent to a clear solution, other oils, otherwise equally good, yield opalescent, turbid solutions. This behavior is perhaps attributable to lead cinnamate which is frequently present in the oil. The oil boils between 240 and 260° with partial decomposition and splitting off of acetic acid. In the distillation flask there remain 6 to 8 p.c. of a viscid residue. For further details see under adulterations and their detection. If to a small amount of cassia oil (4 drops) cooled with ice water, an equal volume of nitric acid be added, the two liquids congeal to a crystalline mass. This reaction, which was formerly given by the German Pharmacopoeia as a test for identification, depends on the formation of a loose addition product of cinnamic aldehyde and nitric acid, which is again resolved into its components by water. As a test for purity this reaction is of no use since even strongly adulterated oils yield these crystals. It should be observed, however, that the reaction mixture should be carefully cooled, otherwise oily products only result. The principal constituent of the oil, which determines its value, is the cinnamic aldehyde, of which good oils contain 75 to 90 p.c. Rectified cassia oil has d15o1,053 to 1,065. Inasmuch as it contains no lead cinnamate, it forms a clear solution with 2 vol. of 70 p.c. alcohol. Composition. Cassia oil, like cinnamon oil, contains cinnamic aldehyde as principal constituent. The chemists who, during the first half of the past century, examined cinnamon oil were acquainted with the differences between the two oils as being due to their secondary constituents. Thus Blanchet1) points out that the odor of cassia oil is much more pungent than that of Ceylon cinnamon oil. Dumas and Peligot2) also referred to the different kinds of cinnamon oil. In connection with the oils distilled by themselves, the details of which need not be mentioned here, they arrived at the important conclusion that the cinnamic acid obtained upon oxidation of the oil is related to the latter or cinnamyl hydride as is benzoic acid to bitter almond oil or benzoyl hydride. In other words, they recognized that cinnamon oil consists principally of the aldehyde of cinnamic acid, viz., cinnamic aldehyde.